As the first facial injectable that gives you subtle results over an extended period of time, Sculptra works wonders to gradually replace collagen that is lost as one ages. Sculptra is made from poly-L-lactic acid, which is a biodegradable synthetic material that can help your body naturally restore lost collagen. This treatment option is perfect for those who want a natural-looking appearance because it corrects shallow to deep facial wrinkles and folds subtly over time. You can experience a younger, more youthful appearance with no surgery. Full treatment typically averages three to four injection sessions over a period of a few months. Treatment times for each session average about 45 minutes. Many patients love this treatment because the results are subtle, gradual, and can last more than two years compared to other filler options. This means you don't have to invest additional time and money just to look good. Reversing the common signs of aging in your face and creating a more youthful aesthetic doesn't have to be an immediate and drastic process. Sculptra can provide you with the look you need through a sensational, yet subtle process that offers improvement in wrinkles and hollowed areas. Many patients experience results that are long-lasting and simply stunning. Areas Treated - Here are some of the most important things you need to know if you are considering Sculptra Cosmetic at our Burbank treatment center. 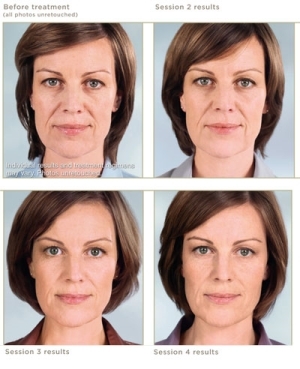 Sculptra treats deep folds between the nose and the mouth (nasolabial folds) also called smile lines. The lines framing your mouth (marionette lines) and chin wrinkles. In addition it is used in any area that has experienced volume loss and appears hollow, such as the cheeks and the temples. Treatment Interval - Sculptra is administered approximately once a month until full correction is achieved. For most people, this is 3-4 treatments. Number of Treatments Required - Three to four treatments over several months can last over two years. Treatment Time - Approximately 45 minutes. Results - Most patients experience improvement in deeper wrinkles and hollowed areas of the face for two years after completing a series of Sculptra treatments. Patients all across San Fernando Valley and greater Los Angeles are welcome. Contact us today to schedulean appointment.